The wire actually weakens the glass and increases the likelihood of breakage even under the relatively mild force exerted by a small child. Even worse, the wire embedded in the fragile glass can snare a hand or leg that passes through the broken glass making injuries more severe. 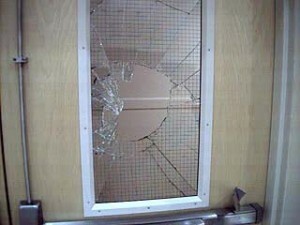 The 2012 IBC bans unsafe traditional glass from all hazardous locations. Click here to learn about what constitutes a hazardous location. 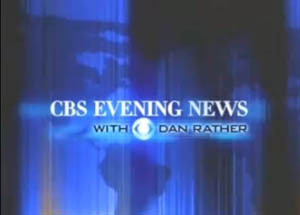 Watch the CBS Evening News video clip (or click image) to learn more about the dangers posed by traditional wired glass. The CPSC safety glazing minimum minimum standard was established in 1977 to protect people from injuries due to accidental impact with glazing. 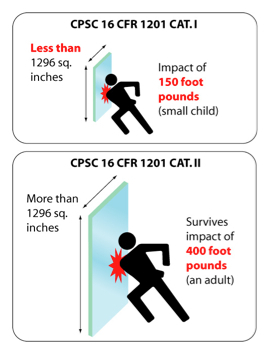 Cat I = for small glazing areas (less than 1296 sq in) to survive impact of 150 foot pounds (a small child). 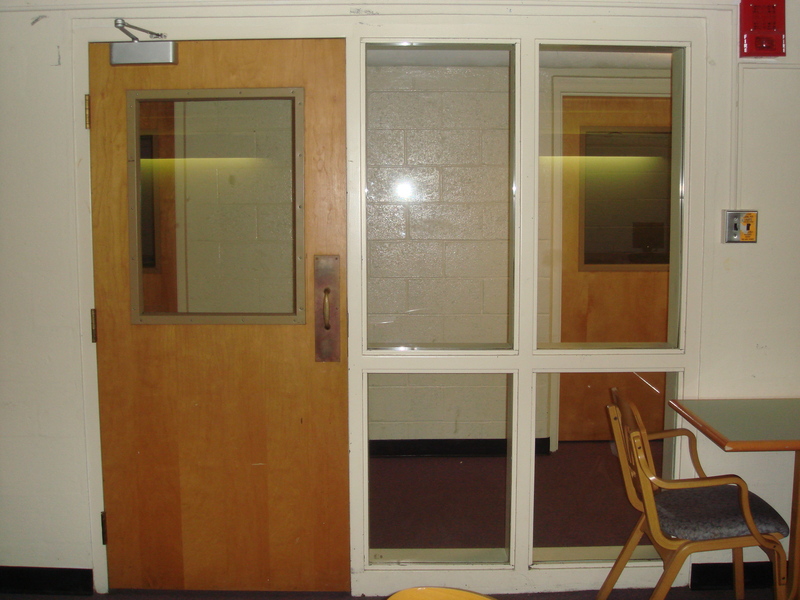 Two decades ago, traditional wired glass was the only fire rated glass available. It never met the CPSC’s safety standards. The codes exempted traditional wired glass where fire rated glazing was needed. That exemption no longer applies. Since 2003, the use of traditional wired glass in doors, sidelites, or locations where impact is a concern has been narrowed. Under the 2012 IBC, unsafe wired glass is not allowed in any hazardous location. 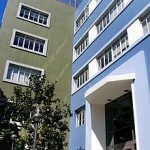 Click to learn more about where impact safety glazing is required. In non-hazardous locations, traditional wired glass may be used up to 45 minutes with size limitations (because it cannot block radiant heat). If traditional wired glass is used in a wall where impact safety is not a concern, it may not exceed 25% of the wall area due to heat transfer concerns. 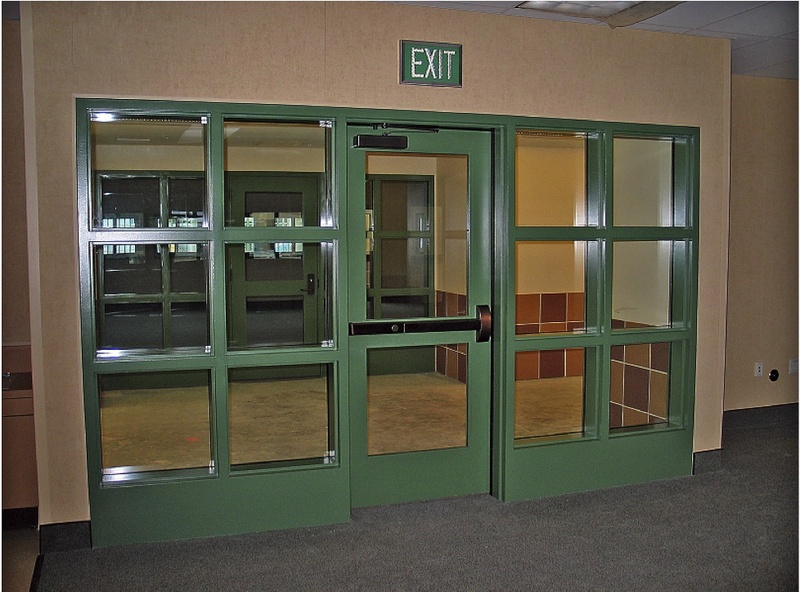 Traditional wired glass is a fire protective, and not a fire resistive glazing product. There is a range of glazing products that can be used to replace or upgrade traditional wired glass in hazardous locations. Thanks to recent advances in glazing technology, many alternatives on the market meet both fire-rated standards and the CPSC impact safety requirements of 16 CFR 1201. 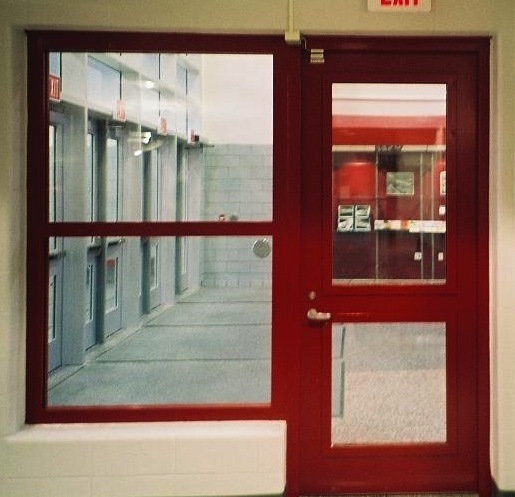 Below is a gallery of clear, wire-free, affordable options for replacing unsafe wired glass in potentially hazardous locations on any school campus. 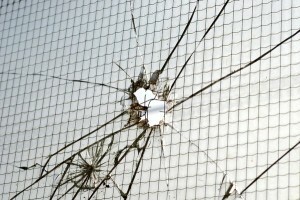 Experts estimate that there are at least 2,300 school injuries yearly from unsafe wired glass. 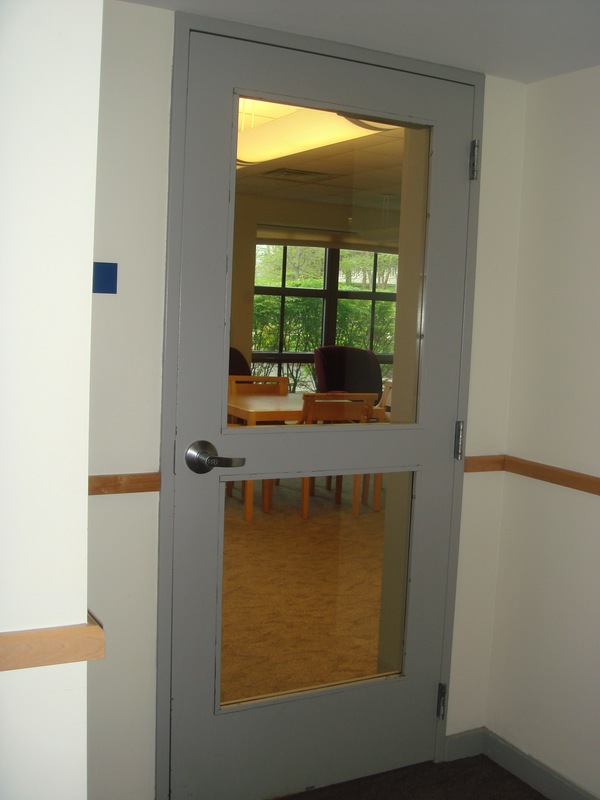 In 2011, an Oregon jury found the Portland Public School district was negligent for not replacing a dangerous wired glass door panel. A 13-year-old student rushing to class attempted to open the door by kicking the metal crash bar. She slipped and her leg went easily through the lower wired glass pane severing two major nerves and 70% of her Achilles tendon. During the trial, it was revealed that the state superintendent had issued a 2003 memo alerting all superintendents of the dangers of wired glass, and that the Portland district had lobbied against a state bill that would have required school districts to replace all wired glass in hazardous locations. Click the image or here to watch a video called “A Fire and Impact Safety Case Study” about a San Francisco high school’s effort to replace unsafe wired glass. 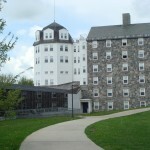 Click the image or here to read about a program at Middlebury College to systematically replace traditional wired glass in hazardous locations throughout the campus.